Many more photos in the gallery. Live locally. Consult your community calendar. Starting Friday, March 14: Horton Hears a Who! Want to feel better? Unstress a little? Get silly? Dr. Seuss works way better than Dr. Phil. Horton Hears a Who! is a hoot and fun for kids and adults alike. Every kid in America (and his or her responsible parent) will see this one. Clever, sophisticated cgi animation, adorable creatures, and a plot that has stood the test of time and childhood scrutiny. Horton, who makes it his business to save an entire microscopic civilization, teaches us everyone is important, no matter how small. Horton will be here a couple of weeks for sure, right through Easter and beyond. Sign up for our weekly newsletter and get movie times delivered straight to your inbox. See you at the movies. 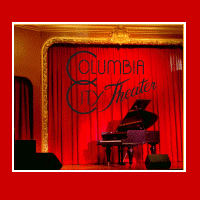 We're Seattle's Historic Vaudeville Theater, complete with a recording studio & lounge. Whether you enjoy catching a unique show and a few tasty beverages or are looking for the perfect place to host an event, we're ready to accommodate! Thu — Nick Deonigi, CD release party, 7pm, SOLD OUT! The Rainier Valley Youth Theater presents the 2008 Young Playwrights Festival. The festival has chosen nine one-act plays from students at Cleveland High School, Lake Washington Girls' Middle School and Summit K-12 School. We will be holding staged readings of the plays on Friday night (Cleveland and Summit) and Saturday afternoon (Lake Washington Girls Middle School). Saturday's festival will also include the South District Journal's Festival of Words and Photos. Please come out and support our community's young artists! Adult (18 and up) admission prices: $5 for the Young Playwrights Festival: $3 for the Festival of Words and Photos: $7 for both. Kids are free. Following the Young Playwrights Festival on March 15 (4-6pm) we will celebrating Southeast Seattle life with poetry, prose and images! At the Rainier Valley Cultural Center (3515 S Alaska St). Adult (18 and up) admission prices: $5 for the Young Playwrights Festival: $3 for the South District Journal's Festival of Words and Photos: $7 for both. Kids are free. On exhibit from March 12 - May 11: featuring works by S.R. Dickie, William Herberholz, Denise Takahashi, Hannah Voss, and Shari Kaufman. In the guest gallery, five Filipino American artists present sarili cycle: a dialogue of love — works by Ruby M. Aquino, James Lawrence Ardena, Rodney Camarce, Cesar Cueva and Maya Santos. Please join us for the Artists' Reception - Saturday, March 15 (5-8pm). This event is free and we encourage the public to attend. 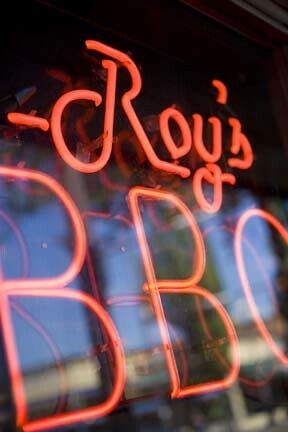 4864 Rainier Ave S. Visit us online. Meeting on Saturday, March 29 at 10:00 AM at Tutta Bella. 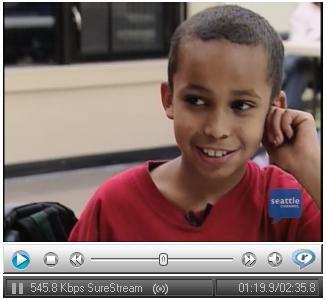 In the summer of 2009, the New School will leave the Columbia School for its new facility in Rainier Beach and for the first time in more than 100 years, a public school may not be operating in the heart of Columbia City. Over the coming year, the Seattle School District will likely decide what to do with the soon to be vacant Columbia School building. The community has founded Friends of Columbia School (FoCS)… Read more. Our group meets Wednesday, March 12th, 2008, 6-8 PM at the Rainier Beach Library. We will have Amy Warren from the Puget Sound Clean Air Agency, and we will prioritize and develop key projects. See you there! 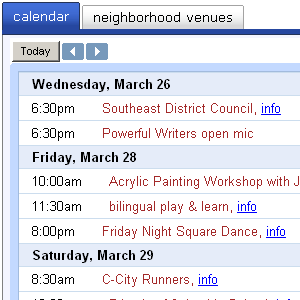 The March 5 BHN/SDJ had pieces on the Hillman City town hall and powerful writers from the New School, but they haven't updated their online content. Maybe next week. A kid can dream, can't she? and Lake Washington Girls Middle School also has an active wiki. A community group has a SPPIFfy new site on Columbia Citizens — the Seward Park Playground Improvement Foundation. The group has formed to help create a safe and special playground for Seward Park. Contact Maura Whalen at moc.cam|htebazilearuam#moc.cam|htebazilearuam if interested. Jenn has tilled and toiled to get the p-patch ready for spring planting, with links from parks.